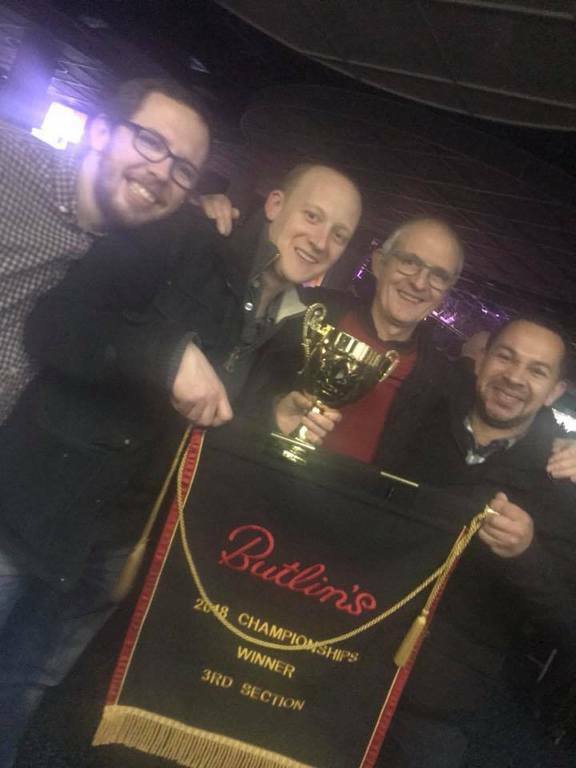 Following our victory at last year’s Mineworkers’ Championships, the band were in high spirits ahead of this year’s contest. This year was entitled “The Year of the Overtures” and each section had a choice of two overtures to select as their contest piece. Our options were William Rimmer’s Rule Britannia or Beethoven’s Egmont, of which we selected the latter. Beethoven’s overture to Egmont is a challenging work, requiring balance, detail and control. The band played well from an early draw (we were drawn to play third out of thirteen bands), and we were delighted to be awarded second place and £1,000 prize money by adjudicators David Ashworth and Mike Kilroy. 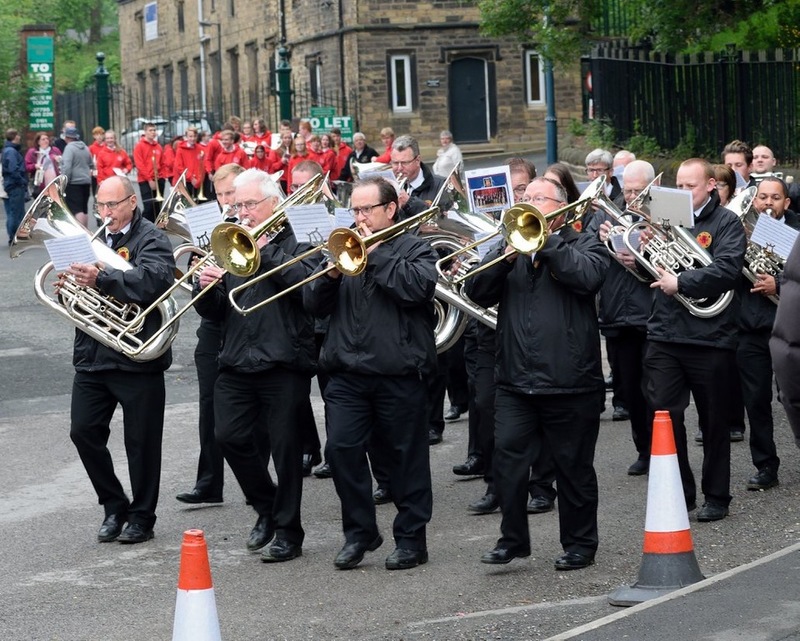 On Friday 25th May, the band took part in "The greatest free show on earth" - the annual Whit Friday Marches. 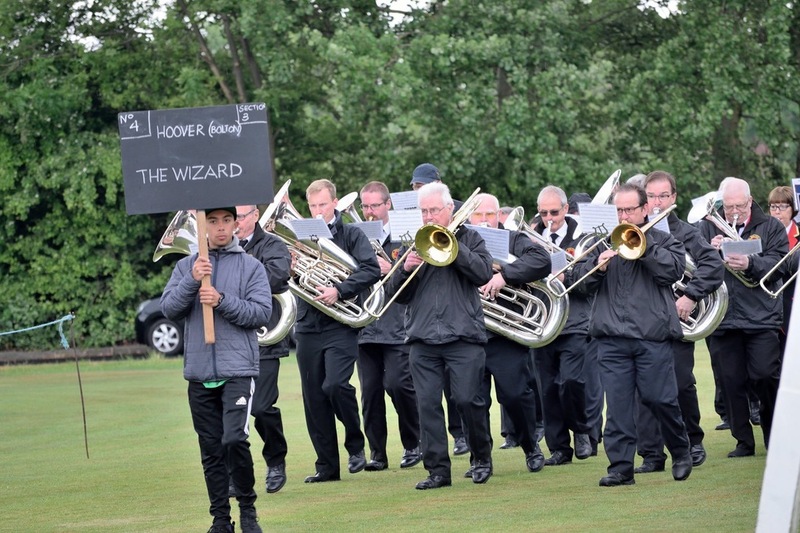 We entered eight contests, six in Tameside and two in Saddleworth, performing George Allan's fiendishly difficult contest march, The Wizard - a march usually played by championship section bands such as Leyland. 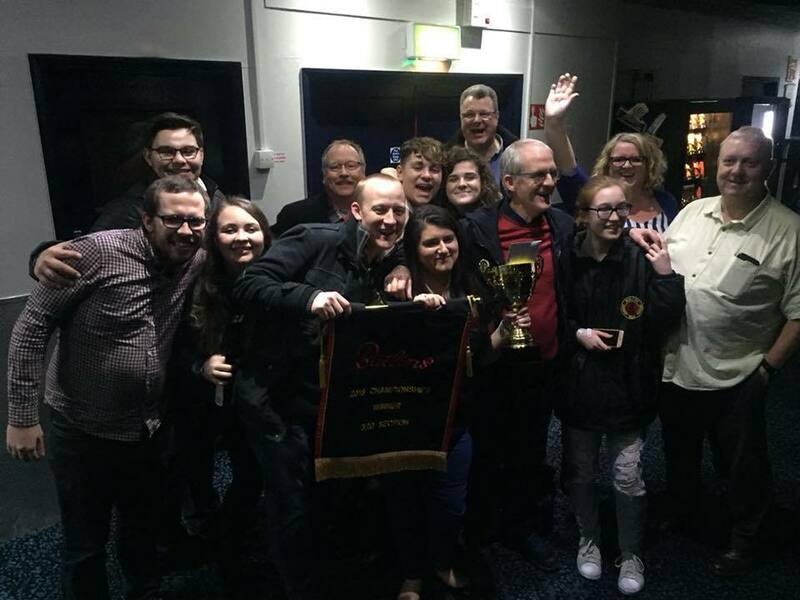 We were delighted to hear that we'd secured third section victories at Heyrod and Tame Valley, but also a couple of third places and the title of overall champion third section band in Tameside! Here is a selection of photos, courtesy of Lawrence Yates, and a video clip of our performance from Droylsden. 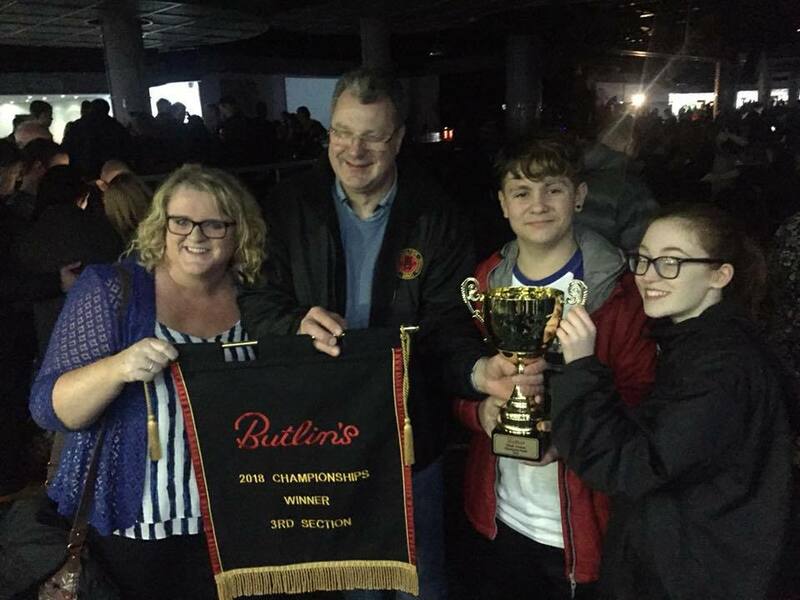 On Sunday 25th February, the band took to the stage of Blackpool's Empress Ballroom in the annual North West Regional Brass Band Championships. The band was drawn to play 3rd out of sixteen bands in our section, meaning that we met for a rehearsal at 8am and took to the stage at approximately 10.15. We gave a confident performance of Philip Harper's contest piece, "Napoleon on the Alps" - a piece which features soloists from around the band, All our solo players excelled themselves - no one more so than Principal Cornet, Sheena Whitehouse who led the band expertly. We were pleased with our performance and our result of 6th place, for which we received a glass trophy. Adjudicators, Leigh Baker and Gary Davies, commented on the band's "confident playing", "full sound" and "good style", whilst described our performance the second movement of the piece to be "very enjoyable". Full results are listed below. 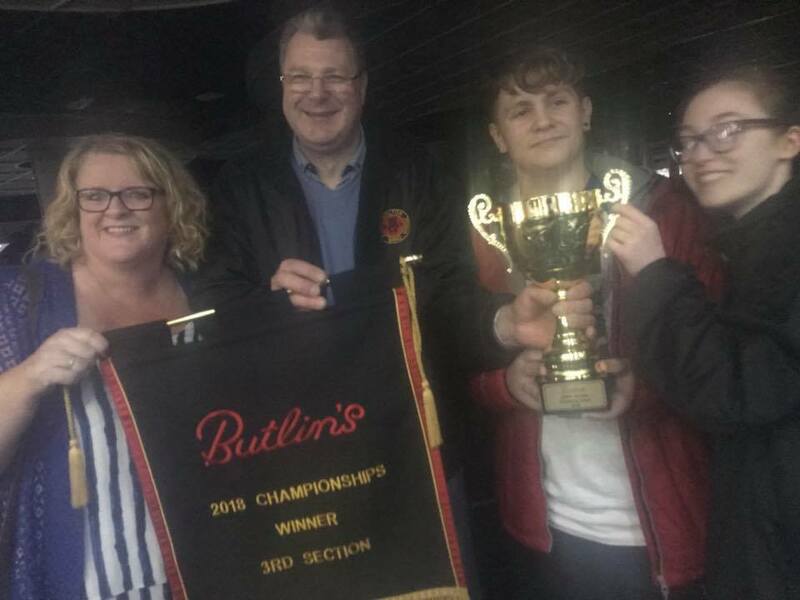 The Bolton (Hoover) Band were, last weekend, crowned 3rd Section National Champions after taking first prize at the National Mineworkers Championships, held in Skegness. The weekend was attended by over 80 brass bands from all over the country, competing across 5 divisions for the prestigious title. The band performed the set test piece, Overture to Henry V, by English composer Ralph Vaughan Williams, and impressed the two adjudicators with a performance that the judges described as "very well played". "I'm so proud of the band. Everyone has worked so hard and this is reflected in such a fantastic result. The band has been in a period of rebuilding over the past couple of years, which makes the contest win even sweeter." Full results can be found below, along with some photos from the weekend! 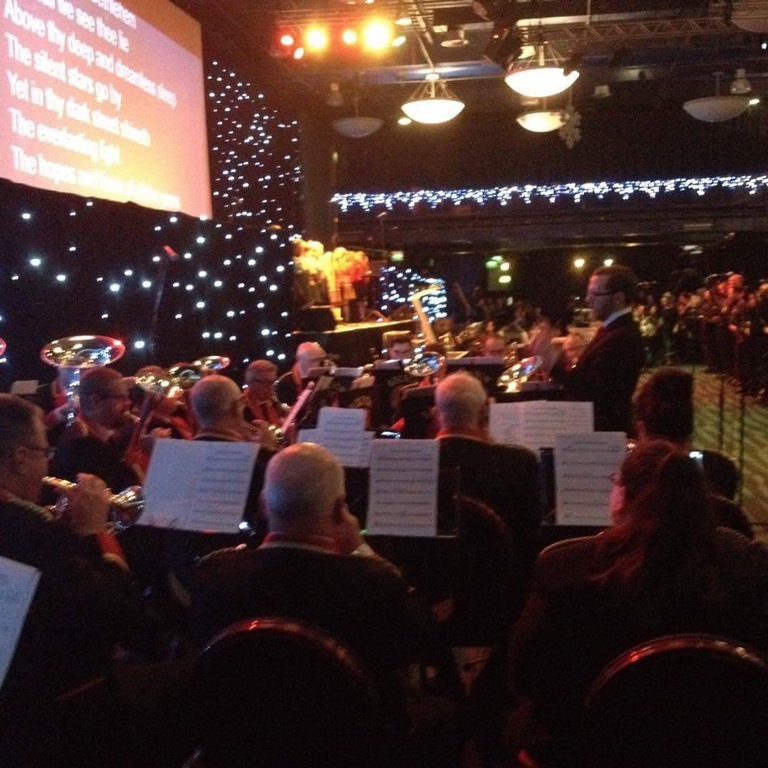 The band performed once again at the Bolton Wanderers Carol Service, in front of an audience of over 1,000 people. As in previous years, the carol service was recorded for broadcast on Tower FM on Christmas morning and the band provided the accompaniment for the carols, as well as a variety of Christmas music ranging from Winter Wonderland to Slade's Merry Christmas Everybody. 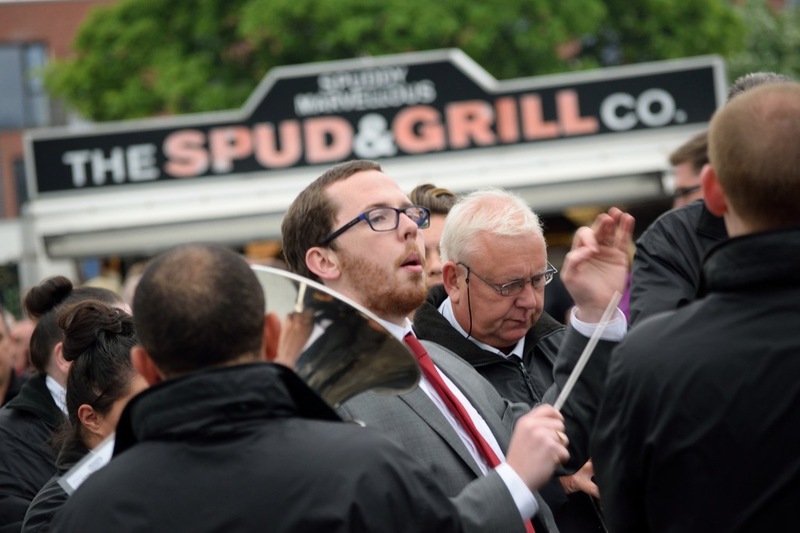 The service was led by BWFC Chaplain, Rev'd Phil Mason, who commented on the excellent quality of the music and the band's professionalism during the event. On Saturday 18th November, the band performed for the very first time at Bolton's wonderful Bridge Church. 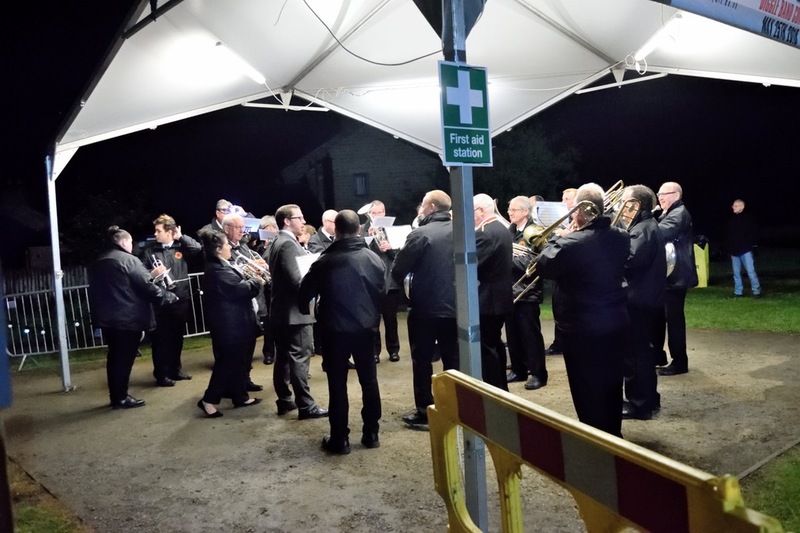 The band were approached eighteen months earlier by Mrs Christine Ogden, who organises the concert annually, in order to raise much needed funds to aid the research into the Muscular Dystrophy Duchenne disease. In the presence of no fewer than three Bolton Mayors, the local MP and a research professor from London, the band performed a wide variety of repertoire, including traditional marches (Death or Glory and The Cossack), musical theatre (Phantom of the Opera and Chitty Chitty Bang Bang) and big band music (Moonlight Serenade and Mack the Knife) before concluding with Leonard Bernstein's fabulous music from West Side Story. As ever, our soloists performed brilliantly - Principal Cornet, Sheena Whitehouse (Misty), Solo Baritone, Andy Marsh (Donegal Bay), Solo Trombone, John Armbrister (Stardust) and Kyle Adams, who wowed the audience with excellent vocal performances of Can You Feel The Love Tonight, and Sinatra's My Way. Also included in the programme were two requests from the concert organiser, Mrs Ogden - Strauss' Radetsky March, and a piece that has very much become the theme tune for the annual concert - ABBA's I Have A Dream. Whilst the final total raised is still being calculated, the band were pleased to support such a worthwhile charity, and as well as performing the concert free of charge, we donated 50% of the evening's CD sales to the charity. We're delighted to announce that the total raised on the evening was over £4,000! 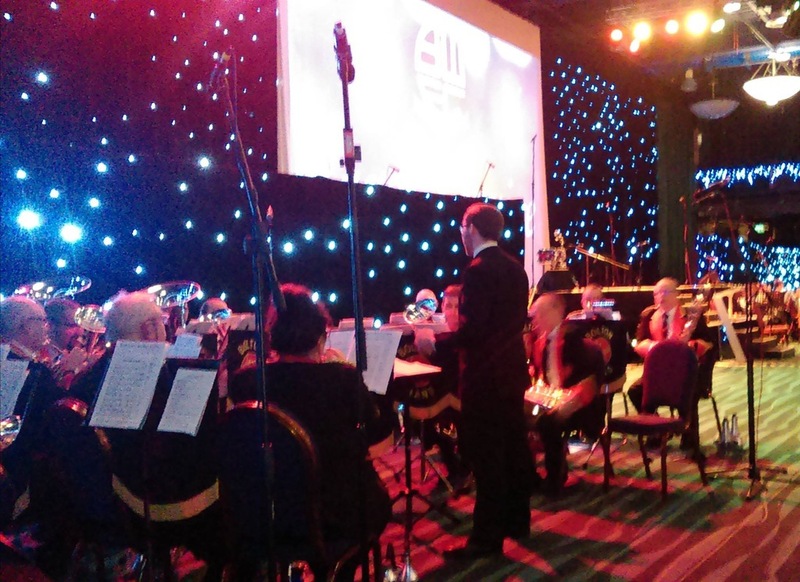 As always, the band had a busy time over Armistice weekend, taking part in a number of acts of Remembrance. The first event took place on Saturday evening at Bolton's magnificent Parish Church, where, each year, citizens from all around Bolton gather to pay respect to the fallen in the form of a concert and service. The band were joined by CATS Amateur Theatre Group, and the Phoenix Knights of Harmony in the concert, which was followed by the Act of Remembrance. The following morning, the band led the town's procession to the Town Hall, where hundreds of people gathered to pay their respects. 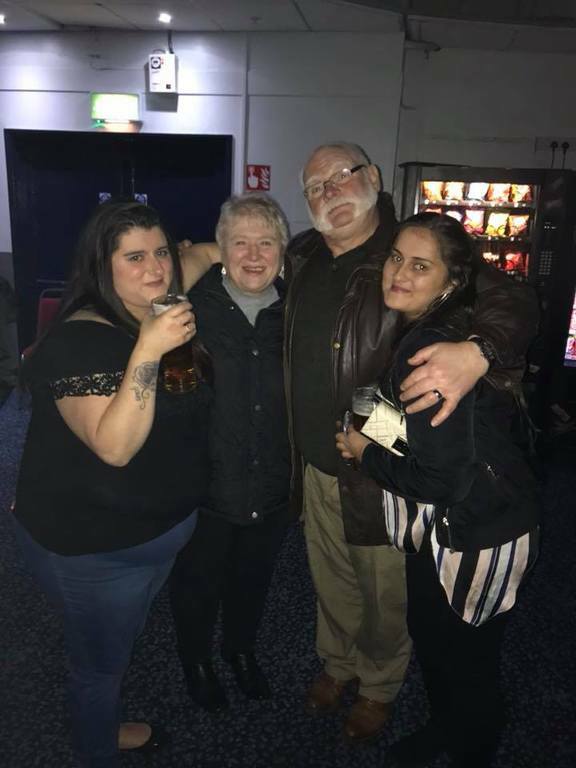 The final event for us was a concert at Bolton's Roundhouse Pub, which concluded with the traditional sing-alongs included Jerusalem, Land of Hope & Glory and We'll Meet Again. Big Band Night at the Uki Club! 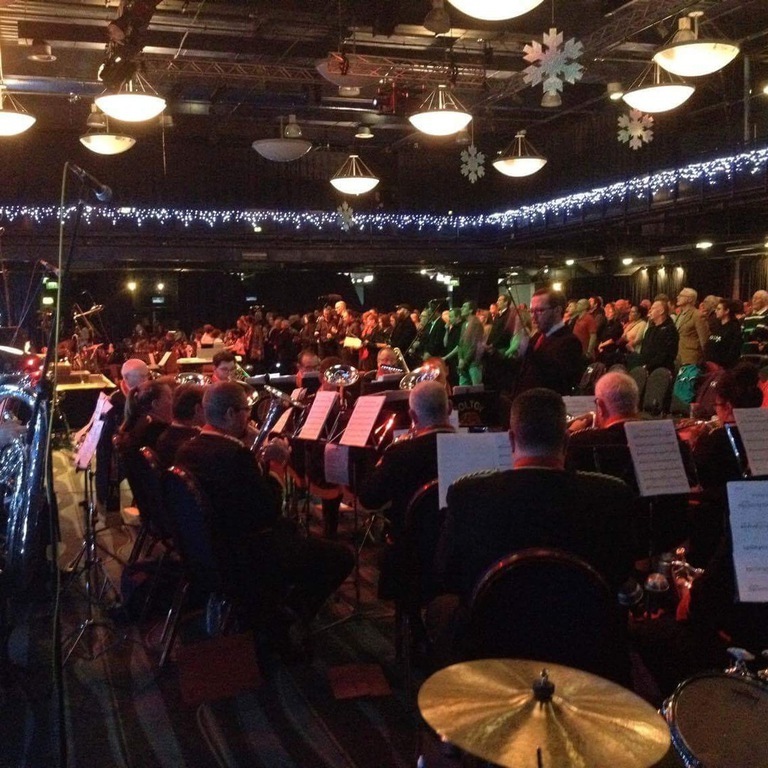 The band once again played to a packed hall at Bolton Ukrainian Club for our Big Band Night. Music ranged from Glenn Miller to Hoagy Carmichael and from Frank Sinatra to Duke Ellington, beginning with A String of Pearls, and concluding over two hours later with Sinatra's My Way. Soloists for the evening included Sheena Whitehouse (principal cornet) and John Ambrister (lead trombone) playing Misty and Stardust, respectively, as well as Kyle Adams (vocal) and Jay Shepherd (trumpet). Kyle's solos included I've Got You Under My Skin, All The Way and Cry Me A River, whilst Jay, who plays lead trumpet for the fabulous Managers Big Band, had the audience pinned to the back wall (almost literally!) with screaming performances of two Ellington numbers - Concerto for Cootie and Portrait of Louis Armstrong, as well as Memories of You and Georgia On My Mind. By the final notes of My Way (performed as an encore by Kyle and the band), a number of the audience were on their feet - a great way to close a great evening! On Saturday 7th October, the band once again joined forces with Stretford Band to perform another charity concert, this time, in aid of MacMillan Cancer Support. 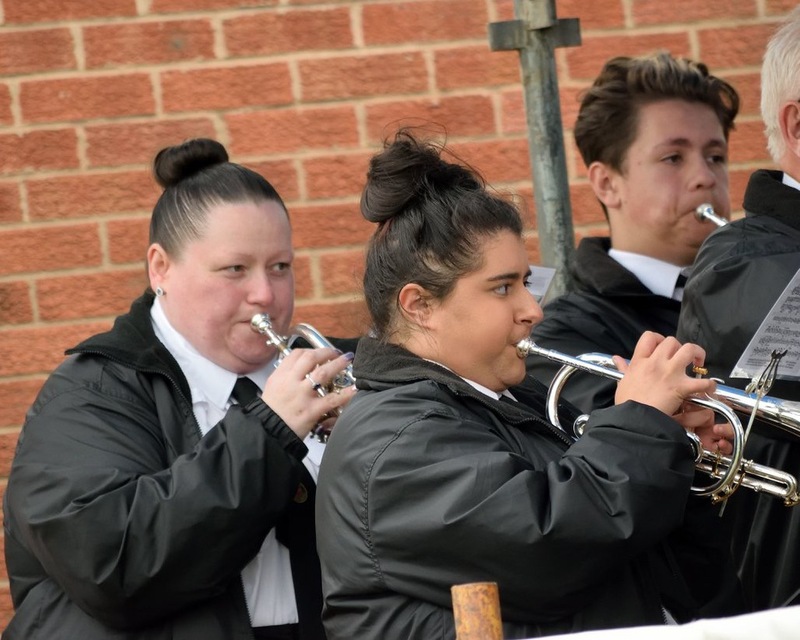 The massed bands played to a capacity audience at Sevenways Methodist Church, and the programme included a wide variety of musical genres. The first half was conducted by Hoover MD, Craig Mann, and Stretford's conductor, Simon Robertshaw, directed the second half. We were delighted to hear that the concert raised a total of £628.77 for MacMillan, beating last year's total of £608.82, which was donated to the Christie Cancer Hospital. 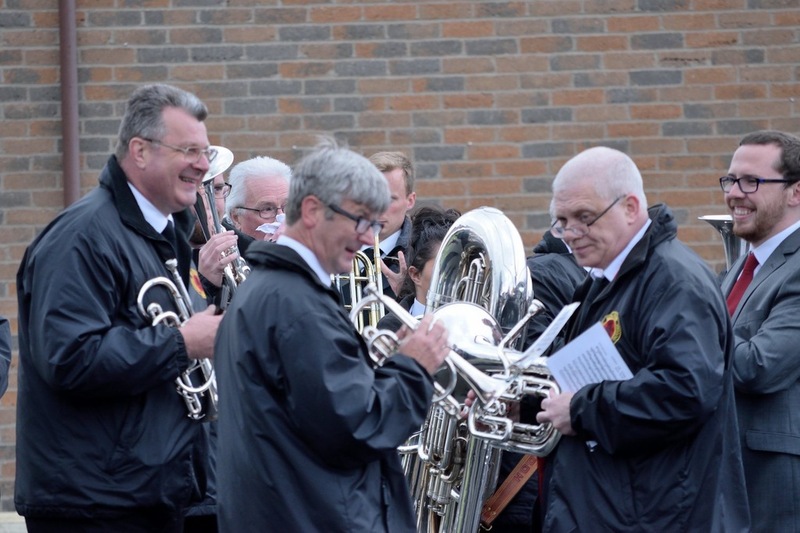 The bands are already in discussion about next year's concert, so watch this space! Here are a few photos of the rehearsal & concert. The band is pleased to announce two forthcoming high profile concerts - at Sevenways Methodist Church and Bolton Ukrainian Club. Click on the posters below for full size images. Saturday 7th October sees the band once again join forces with Stretford Band, following our highly successful joint concert last year. The concert is at Sevenways Methodist Church, Stretford, and will raise money for Macmillan Nurses. Saturday 14th October sees the band performing at our home venue, Bolton Ukrainian Club, in a concert featuring the very best of music from the Big Band era. With guest soloists Jay Shepherd (trumpet) and Kyle Adams (vocal), the evening will feature music from the likes of band leaders Glenn Miller & Duke Ellington, as well as some of the great big band singers, from Frank Sinatra to Michael Bublé. 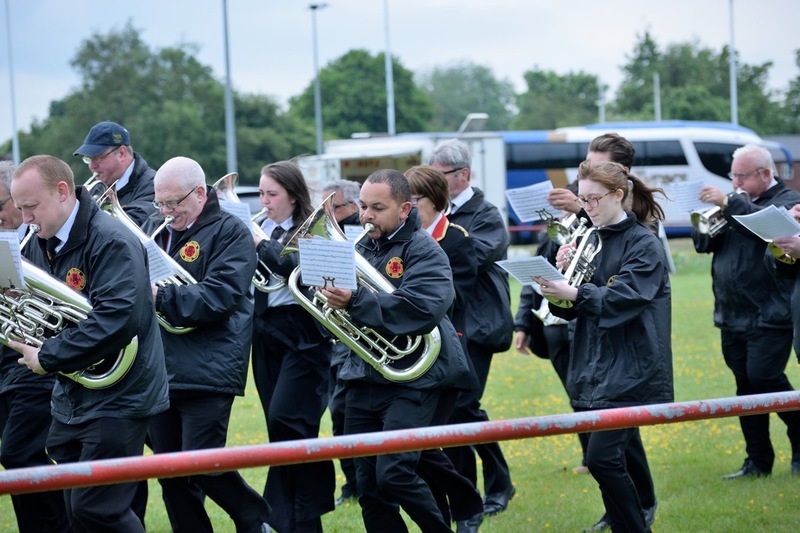 On Sunday 10th September, the band performed at the third annual Blackburn & Darwen March Contest, playing the march, The Cossack and hymn tune, There Is A Green Hill Far Away. Despite the torrential rain, the band gave a solid performance, and videos are posted below, along with a full list of results. Apologies for our lengthy absence in updating the website! We're currently preparing for our Autumn engagements, beginning with Blackburn & Darwen March Contest on Sunday 10th September, followed by two high profile concerts in October. See our Engagements page for more details. Over the Summer, we were sorry to see the departure of Flugel player, Stuart Speakman. Stuart has been a member of the band for the past twelve months and has given some great performances on both the concert and contest stage. Stuart's replacement on Flugel comes in the form of long-serving Hoover player, Martin Jackson. 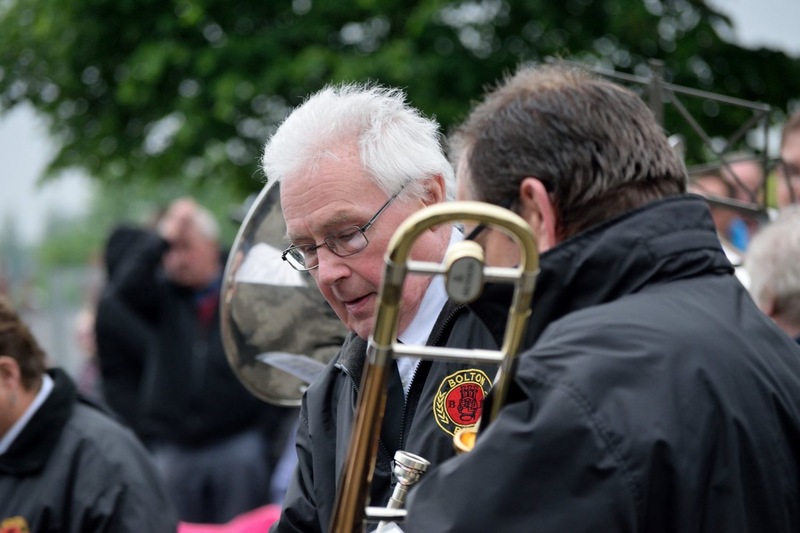 'Jacko' played Flugel for the band many years ago before moving onto Cornet, latterly occupying the Repiano seat. In turn, the Repiano seat will now be occupied by one of our youngest members, Jacob Berry, who has already demonstrated his excellent playing ability, performing duets in concerts with our Principal Cornet, Sheena Whitehouse. On Sunday 2nd October, the band joined forces with Stretford Band in a charity concert to raise money for the Christie Cancer Hospital. 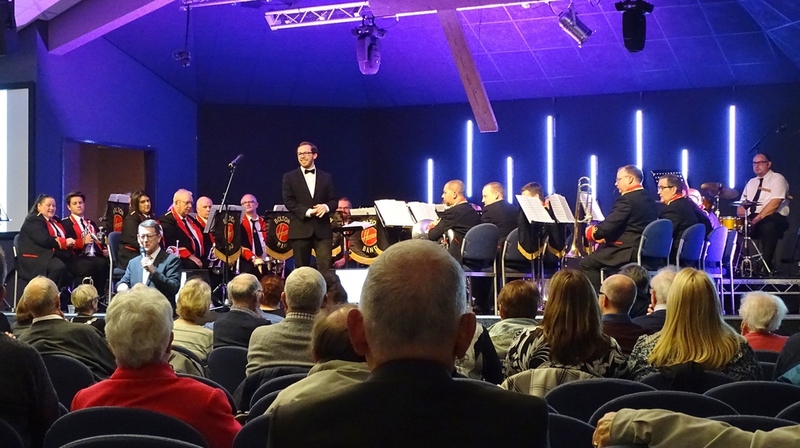 The concert opened in rousing style with both bands on stage, conducted by Ian Mitchell, playing Imperial Echoes, Light Cavalry and Amazing Grace. This was followed by a half hour set by each of the bands, before they joined together again for a massed finale of Ellan Vannin, Mr Blue Sky and Wagner's Procession to the Cathedral, conducted by Craig Mann. 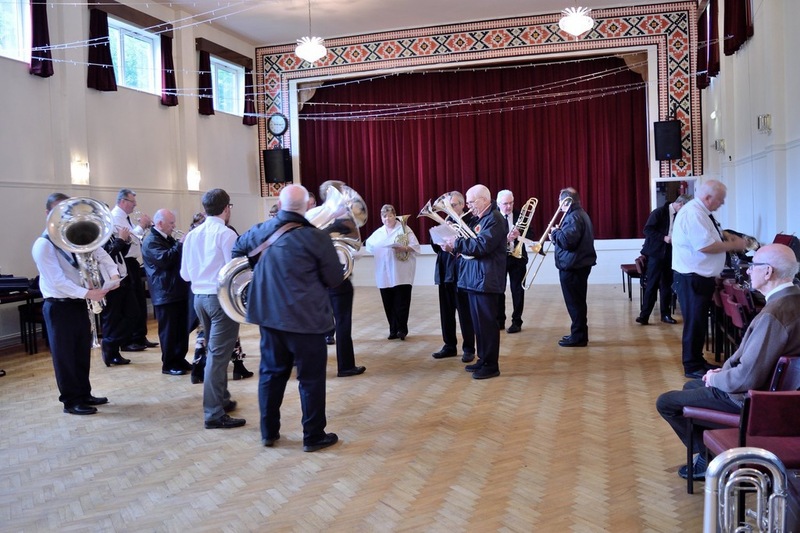 The bands performed to a capacity audience at Bolton Ukrainian Club and the concert raised a total of £648.82 for The Christie. We're delighted to announce that on Sunday 2nd October 2016, we will be joined by our friends from the Stretford Brass Band, in a concert to raise money for the Christie Cancer Hospital, Manchester. The concert will include an individual set by each band, as well as a number of massed items. The concert will take place at Bolton Ukrainian Club, Castle Street, BL2 1JP, and will begin at 7pm. Tickets are priced at £7, and this includes pasty & peas during the interval. Tickets are available from Andy Pearson on 07891 860 482 or can be purchased on the door. All proceeds to Christies, so please spread the word! On Sunday 11th September, the band took part in the 2nd Blackburn and Darwen March & Hymn Contest, which took place in Darwen town centre. Each of the seventeen bands performed a road march, a hymn tune and a contest march. For our road march, we played Ivanhoe, which was followed by Roy Newsome's wonderful arrangement of There Is A Green Hill Far Away. Our final piece was our contest march, The Cossack by William Rimmer. 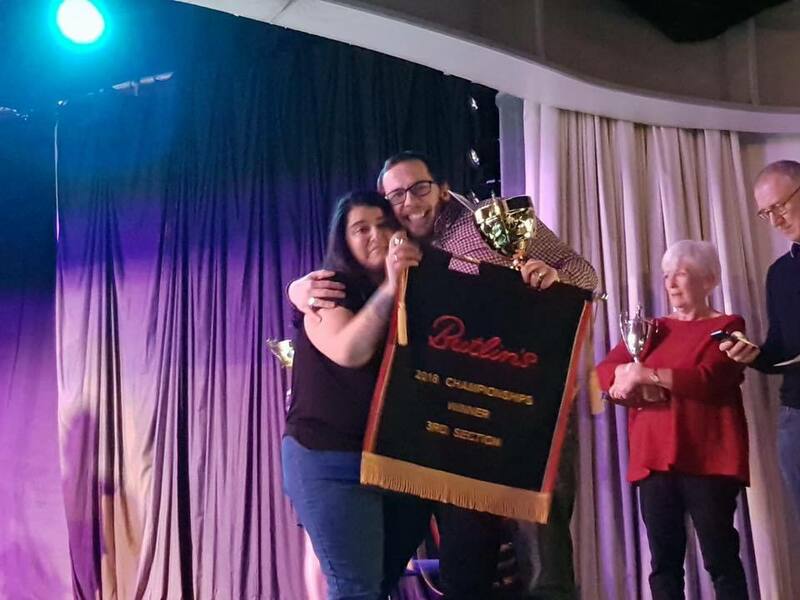 Unfortunately we didn't feature in the prizes but all the players were more than happy with the quality of our performance, and are looking forward to our next contest appearance at Rochdale Town Hall on Sunday 23rd October. There have been a number of player changes in recent months at Hoover. We've welcomed some new players, welcomed back some former players, and said goodbye to a long-standing member of the band. We're delighted to welcome three new cornet players to our band - Lauren Brabiner (repiano), Jacob Berry (3rd cornet) and Phoebe Coleman (3rd cornet). Phoebe and Jacob both attend Canon Slade School, and Lauren joins us from Smithills. 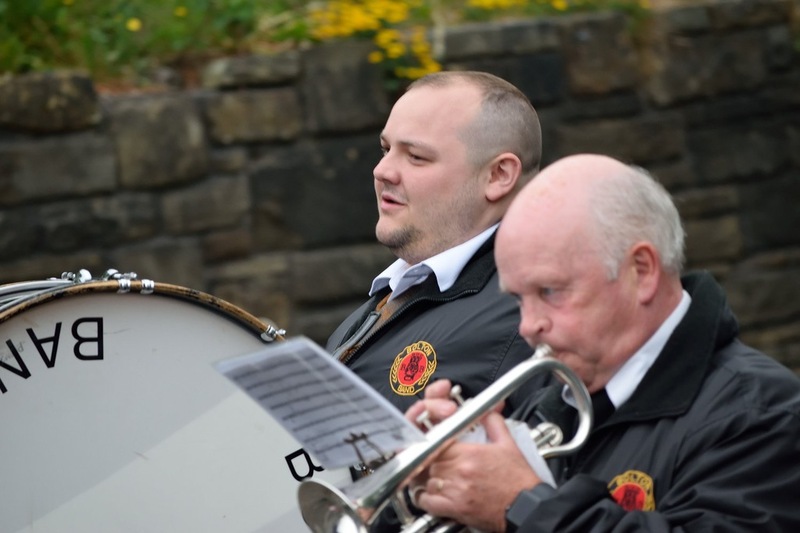 We are also very pleased to announce the signing of father and son duo, Paul and Oliver Atherton, who join the band from Darwen Brass, playing drum kit and 2nd trombone, respectively. Our final signing sees the return of a long-serving member of the band, Roy Wilcock, who joins on BBb bass following a ten year break from playing. Roy joins Eddie, Charlotte and his old partner-in-crime, Stef, to complete our bass section. 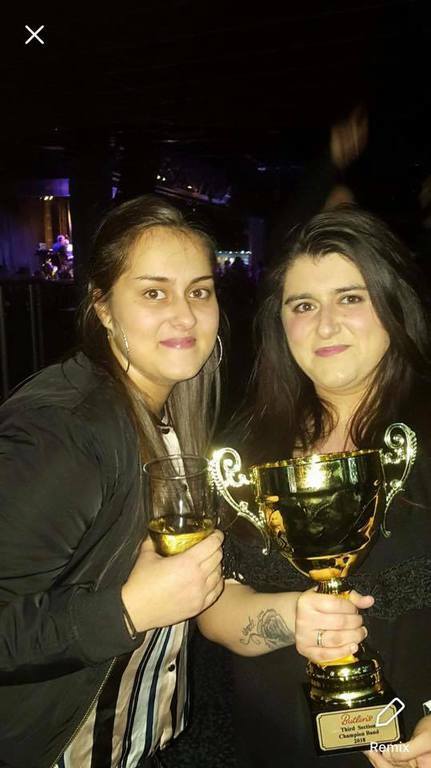 Sadly, following the Whit Friday march contests, we said goodbye to our long-standing and talented flugel player, Amy Mansour. Amy leaves the band with our very best wishes, and we hope that it won't be long before we see her again, when her busy work schedule permits. 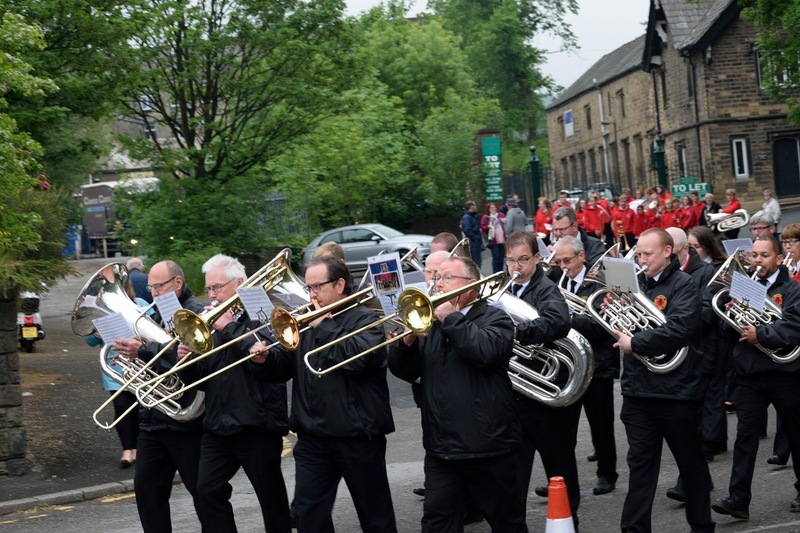 The band recently took part in the Whit Friday March competitions which take place every year in the villages of Saddleworth and Tameside. 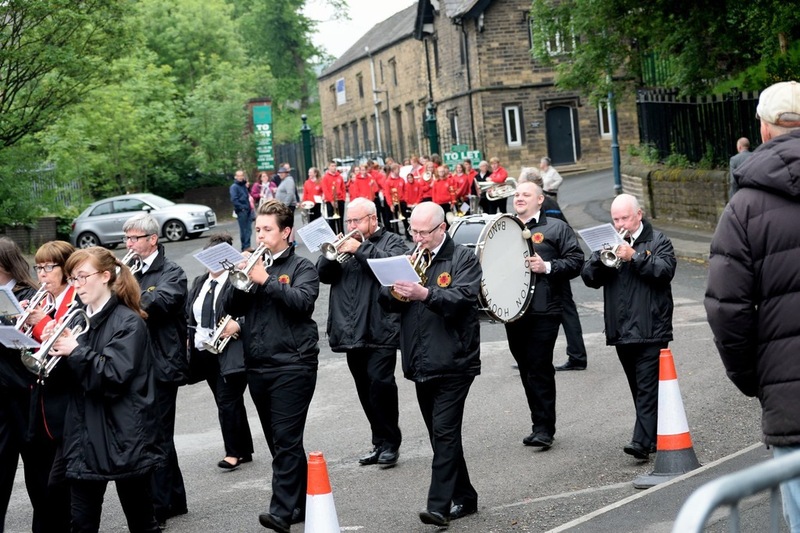 The band entered seven competitions, performing William Rimmer's march, "The Cossack", competing in the second second, and were delighted to be awarded first prizes in Carrbrook, Broadoak and Stalybridge. Congratulations to the Foden's Band who won the overall Tameside prize, and Brigouse & Rastrick who took the top honours in Saddleworth. 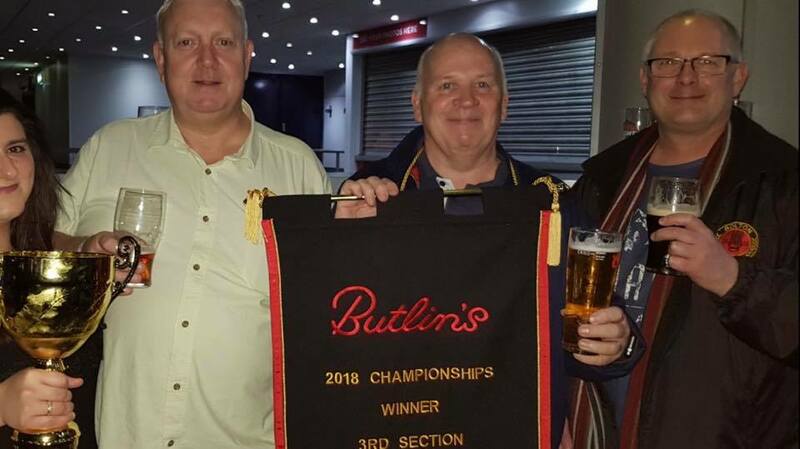 The band recently returned from Skegness after taking part in the Butlins Mineworkers Championships, where we competed in the 2nd Section. 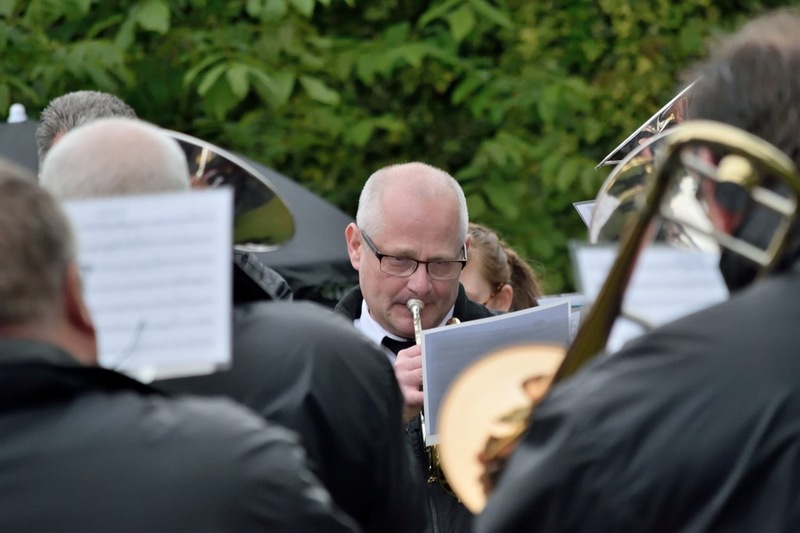 Despite giving an excellent performance of Paul Lovatt-Cooper's test piece, Fire in the Blood, the band were placed fourteenth out of twenty four bands. Although we were all a little disappointed by the result, we were pleased and encouraged by the comments given by adjudicators Leigh Baker & Brian Rostron about our performance. Special mentions were given to Sheena Whitehouse (Principal Cornet), Amy Mansour (Flugel) and Kyle Adams (Solo Euphonium), as well as very positive remarks about the amount of detail in our performance. 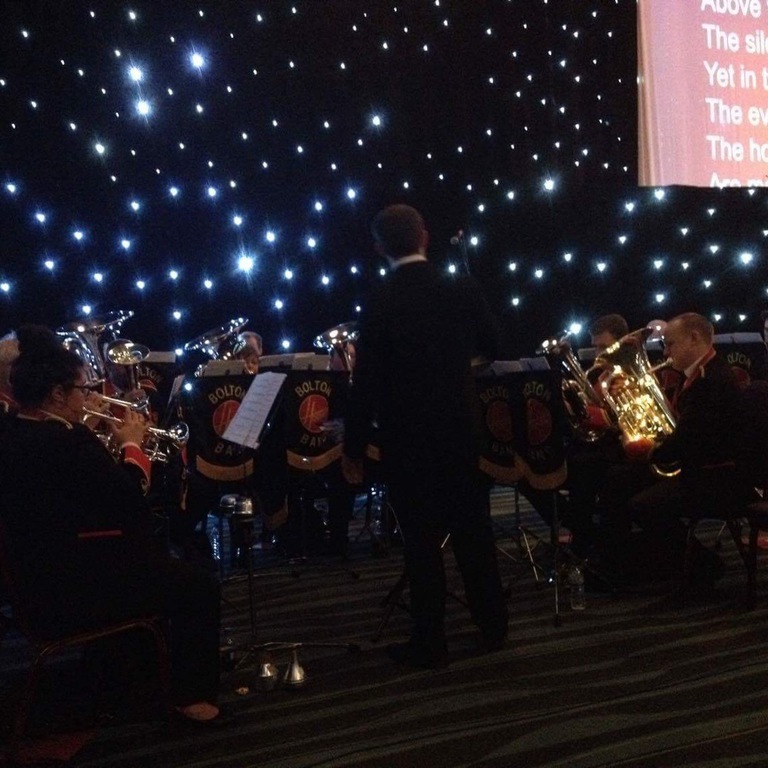 On Monday 7th December, the Bolton (Hoover) Band joined forces with the town’s football team for the Bolton Wanderers Christmas Carol Service, held at the team’s home, the Macron Stadium. 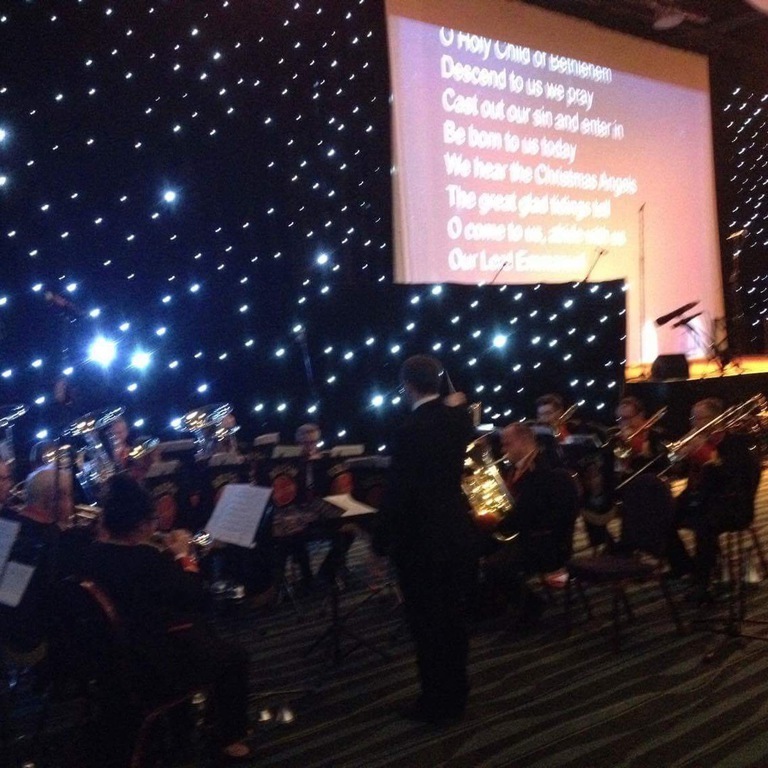 The band accompanied the carols, performed a couple of solo spots, and provided the music for a game of “Name That Christmas Tune”, which was played by the audience of over a thousand people. The service featured the usual Christmas favourites, including Silent Night, Away in a Manger, O Little Town of Bethlehem and fanfare arrangements of Hark the Herald and O Come All Ye Faithful. This is the second time the band has been invited to take part in the event, having performed to great reception last year. Highlights from the event will be broadcast on Tower FM on Christmas morning. Following on from our hectic Remembrance weekend, the band rehearsed every night between Monday and Thursday, in order to prepare for an intense two days of recording for our new CD, Starburst. We recorded the first eight tracks on Saturday 14th November, followed by the remaining eight on Sunday 15th, and the CD was recorded by the fabulous KMJ Recordings, with sound engineer, Keith Johnson and producer, Jessica Tredrea. The tracks recorded included the title track, Starburst, along with Ticket to Ride, I Got Rhythm, I Write the Songs, and the unofficial Manx "National Anthem", Ellan Vannin. The CD will now be edited and mixed, and should be available to purchase early next year. As always, the band played its part in the Remembrace weekend events, beginning with a concert at Bolton Parish Church on Saturday 7th November. The concert usually takes place at Bolton's Albert Hall, but was moved to the church due to refurbishment work. The band performed at the beginning of the second half, before leading the singalong items at the end of the evening, including We'll Meet Again, Pack Up Your Troubles, Jerusalem and Land of Hope and Glory. We were all up and out bright and early on the Sunday morning, as we marched the veterans to the town hall steps, where the service of Remembrance took place. Our final engagement of the weekend was a concert at Bolton's Roundhouse pub, where music included tracks from our new CD, such as Arnhem, I Write the Songs, Let's Face the Music and Dance, and All the Way, which was sung by Kyle Adams, and which received the greatest ovation of the entire weekend. We're delighted to announce that Andy Marsh has joined the band on Solo Baritone. Andy has been a dedicated member of the Eagley Band for many years, but he decided the time was right to move on. 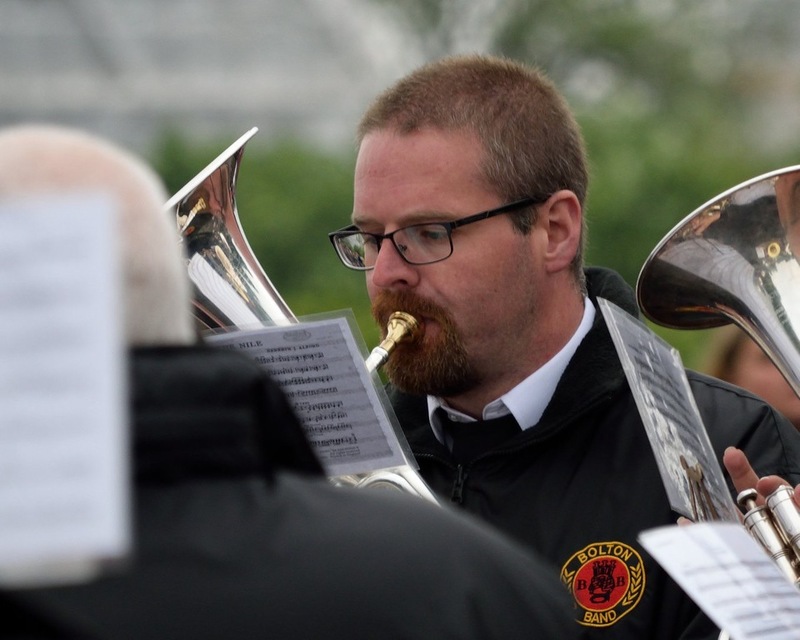 MD, Craig Mann commented, "Andy is an excellent player, and a dedicated, lifelong brass-bander. He will, I'm sure, be a huge asset to his section and to the band as a whole." Our sincere thanks must go to Kay Brannan, who has been helping us out a great deal over the past couple of months on the Solo Baritone seat. Bolton (Hoover) Band is recording its third CD, which is scheduled for release early next year. The CD will follow on from our two previous albums "A New Beginning" and "Resurrection" and will include highlights from this year's concert programme, as well as a couple of new pieces which will feature in next year's concerts. The CD is likely to be entitled "Starburst", named after the piece by Dan Price, which will open the CD, and that we believe has never before been professionally recorded. The sessions will take place on 14th & 15th November, and the CD recorded and produced by KMJ Recordings. Our Last Night of the Proms concert on Saturday 19th September marked the final appearance (for now) of Kate Barlow on our Solo Baritone chair. 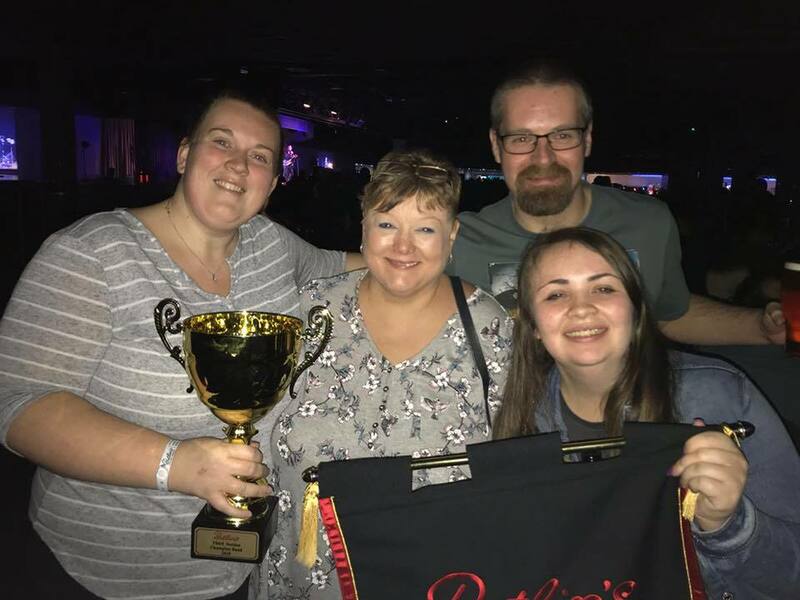 Kate has been a member of the band for many years, both on tenor horn and baritone, but she is due to have a baby in December so has stepped down from playing for the time being. Best wishes Kate! In Kate's place, we're delighted to welcome back our former Solo Baritone player, Kay Brannan - yet another long-serving member of Hoover. 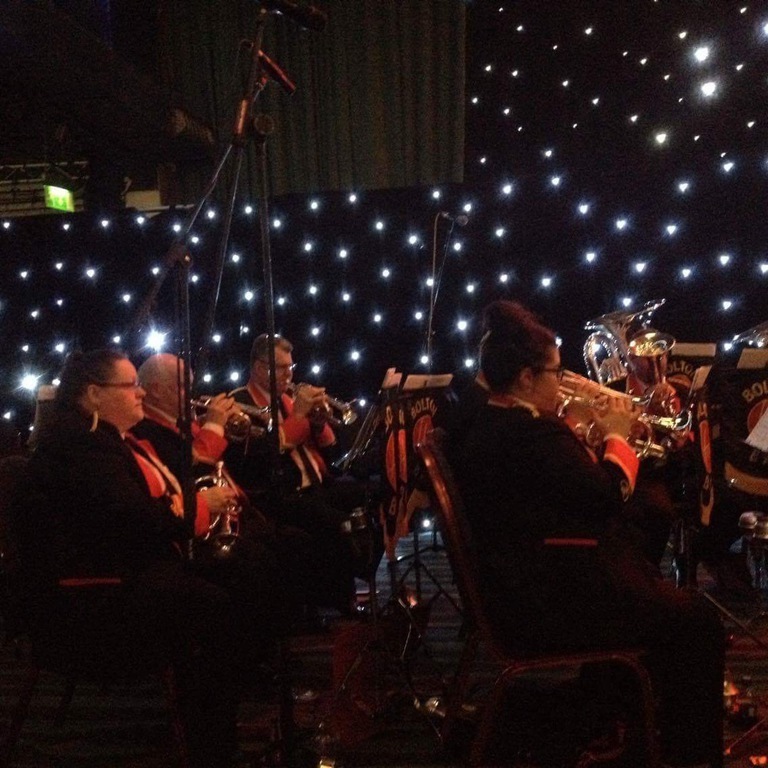 On Saturday 19th September, the band performed a Last Night of the Proms concert at Kearsley Mount Methodist Church. The first half of the concert comprised music from the band's normal concert repertoire, including "Let's Face the Music and Dance", "Symphonic Suite from Mary Poppins" and "An American Trilogy", along with two outstanding solo performances by Amy Mansour (Flugel) playing "Misty" and Principal Cornet, Sheena Whitehouse, performing "Solitaire". The second half of the concert provided the audience with a whistle-stop tour of Britain and Ireland, with folk melodies from the four countries, including "Amazing Grace", "Men of Harlech" and "An Irish Tune from County Derry". A highlight for many was the "Irish Blessing", which featured a quartet to begin and end the piece - Amy Mansour (Flugel), Charlotte Garbett (Solo Horn), Kate Barlow (Solo Baritone) and Danny Lowery (Euphonium). It was especially significant for Kate, who is now taking a break from the band to have a baby. The finale to the concert was the traditional Proms set - "Fantasia on British Sea Songs", "Jerusalem" and "Pomp & Circumstance March No. 1", all of which featured excellent audience participation, singing, clapping and flag waving. After a final chorus of "Land of Hope and Glory", the evening concluded with the National Anthem and Auld Lang Syne, with members of the audience on their feet, singing and holding hands. Audience comments after the concert were full of praise for the band, and the evening was described as "fantastic", "wonderful" and "uplifting". We're pleased to welcome 3 new players to the band. 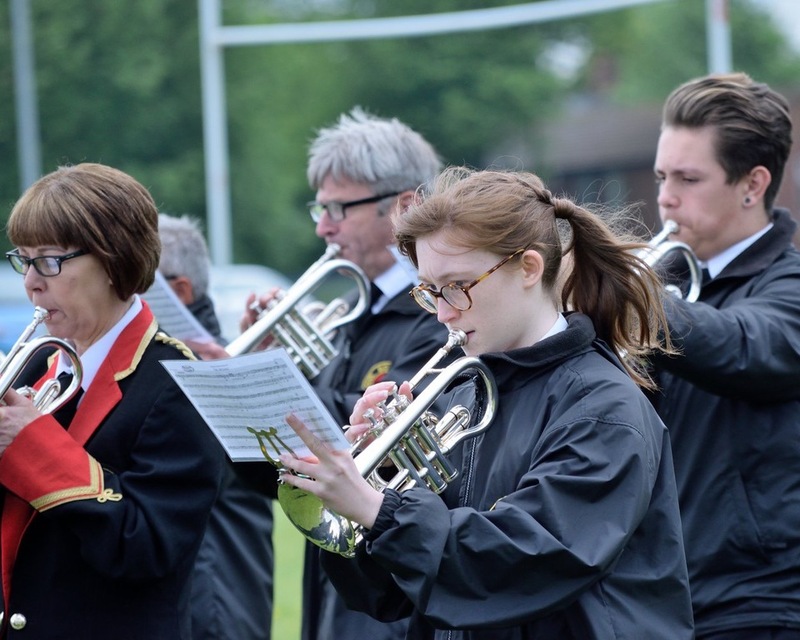 Pete Spencer (Bass Trombone) and Deborah Seddon (Soprano) join from Coppull & Standish Band, and Sue Jackson returns to the band on 3rd Cornet after a ten-year break from playing. As well as this, our former sop & rep players, Kyle & Andy, have gone over to the dark side and are now our new euphonium team. They will join solo euph, Ben, for the next couple of months before he leaves for university in September. 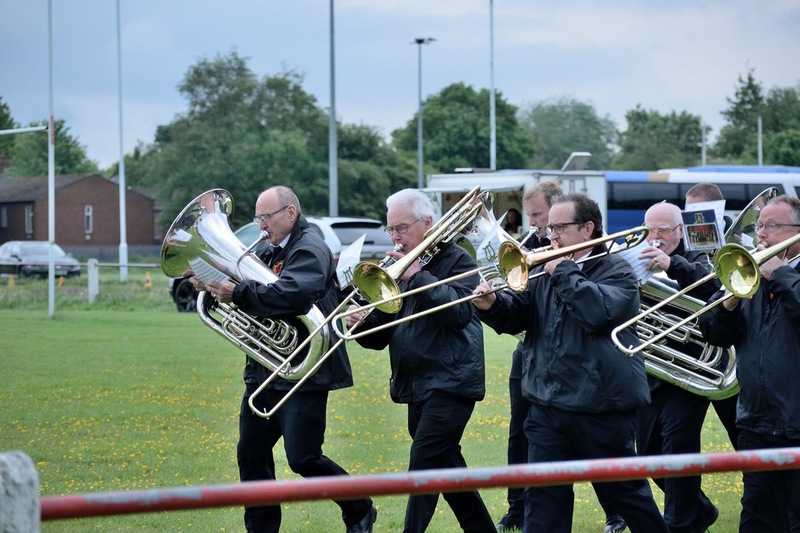 The band took part in the Whit Friday March Contests on Friday 29th May, and visited seven villages: Denton, Audenshaw, Droylsden, Broadoak, Upper Mossley, Heyrod and Lydgate. 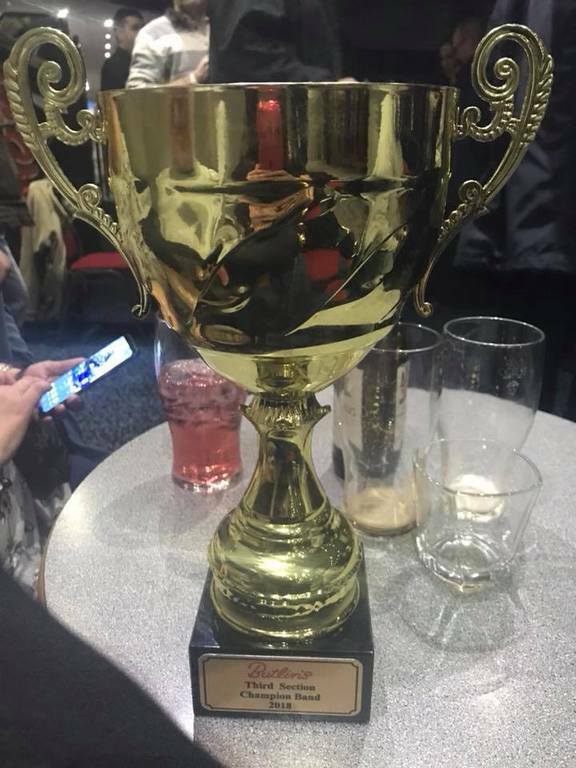 Like last year, our contest march was William Rimmer's Viva Birkenshaw. The band gave seven solid performances, and we were the final band to perform at Lydgate, playing in pitch darkness. A clip of our Audenshaw performance can be seen on the Videos page. You can also find photos from the evening in our Gallery. We are sad to announce the departure of Tom Hillary, the band's principal percussionist. 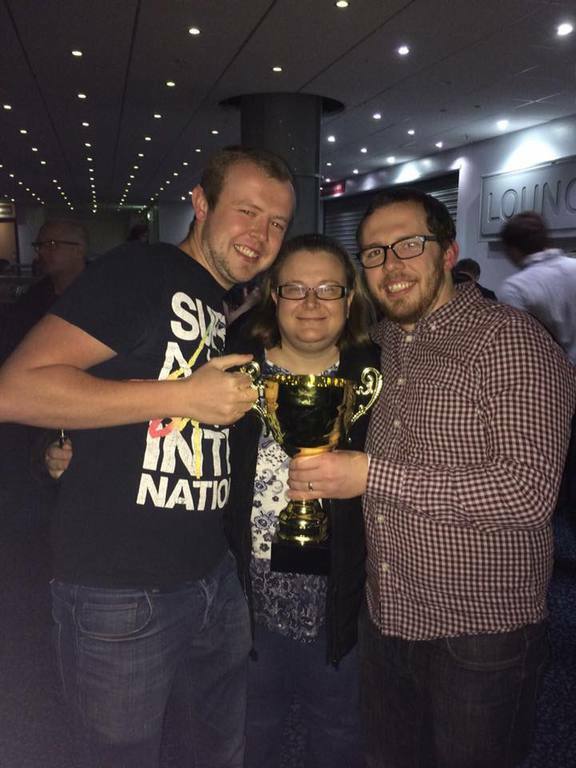 Tom, who has led the section for the past two years, is leaving the band to join the Westhoughton-based Wingates Band. Wingates are a famous name in banding, and are in the Championship section. Hoover would like to thank Tom for his dedication over the past couple of years, and wish him all the very best with his playing career at Wingates. Despite a disappointing 13th place at Blackpool's North-West Regional Contest, the band hasn't stopped the hard work. 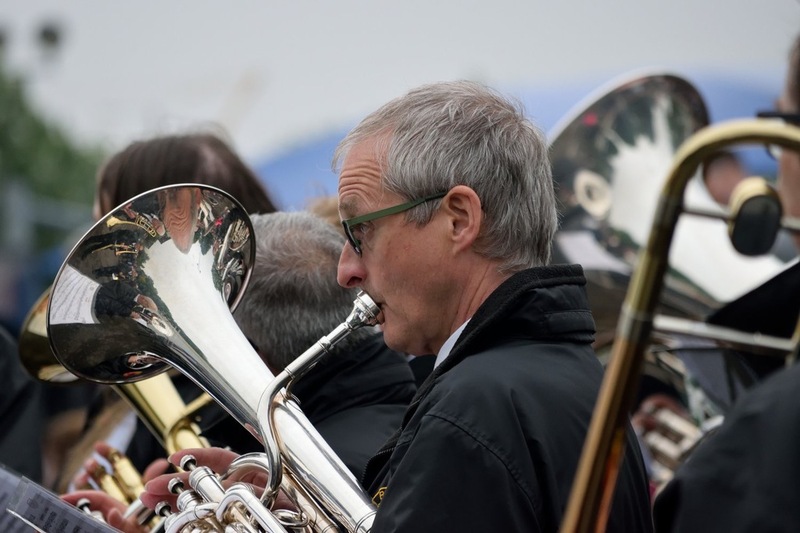 June marks the beginning of our exceptionally busy summer season, which sees the band performing nearly every weekend, sometimes twice in a day. 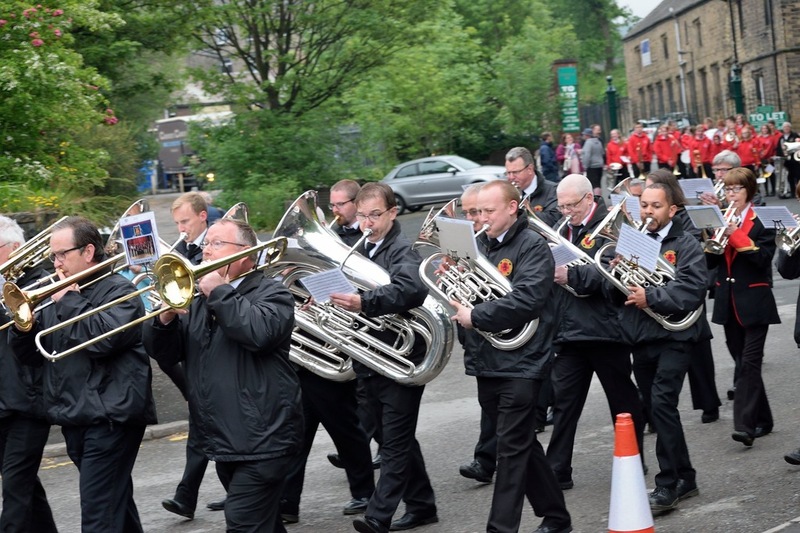 Before that, however, we will be participating in the annual Whit Friday March Contests around the villages of Tameside and Saddleworth, where, like last year, we will play the Contest March, Viva Birkenshaw. Plans for the coming months include a couple of formal concerts in the Bolton area, Whit Walks, and a Last Night of the Proms event in September. Please see our events page for full details of our concert schedule. It is with sadness, that Solo Euphonium, Andy Jackson, has decided to leave Hoover Band Bolton. Andy has succesfully spent 11 memorable years with the band and participated in many contest successes alongthe way. The most memorable moment being the band's success at the Harrogate national finals when theband were in the 3rd section, 2003. Andy played a key role in helping the band to achieve promotion to thefirst section, something of which he is very proud. The Band would like to take a moment to thank Andy for his faithful service over the past 11 years, which without his help, would not be where they are now. Hoover help raise brilliant amount of money for St Ann's Hospice. 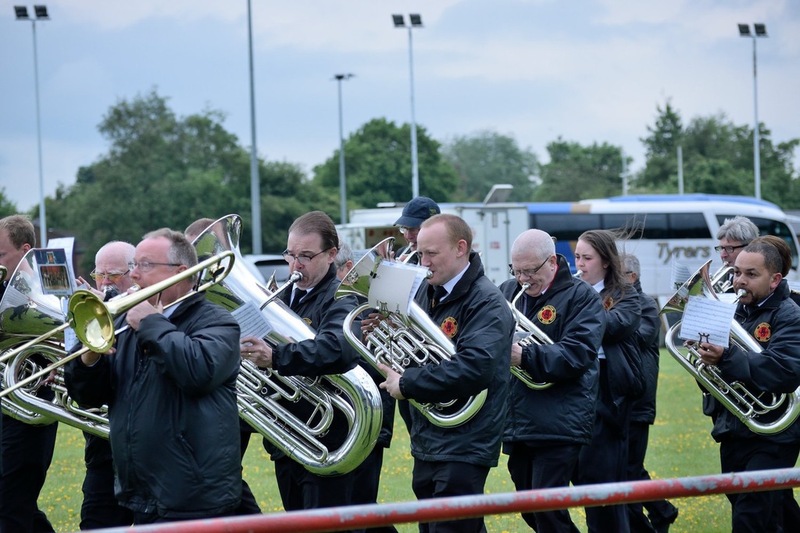 Last weekend, the band were fortunate enough to be asked to perform at the Little Hulton Christmas Fayre to raise money for St Ann's Hospice. The purpose of the hospice is to provide excellent care and support to people living with or affected by life-limiting illnesses in the Greater Manchester area. Therefore, we are amazed to hear the news that we have helped this wonderful charity to raise £5,427.72 with more money still to be counted. 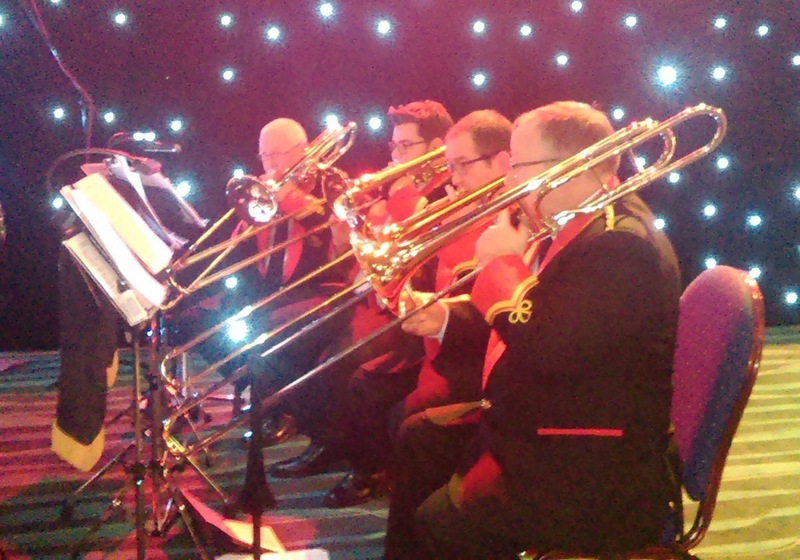 On Sunday 19th October, the band performed to a packed hall at Bolton Ukrainian Club. The venue is home territory for the band, as they rehearse in an upstairs room of the same building, but nevertheless, the players were delighted to see every seat taken, with a number of spectators standing at the back of the hall, and into the foyer. The concert opened at 7.30pm with George Gershwin's 'I Got Rhythm' and concluded some two and a half hours later with Irving Berlin's 'Puttin' on the Ritz'. 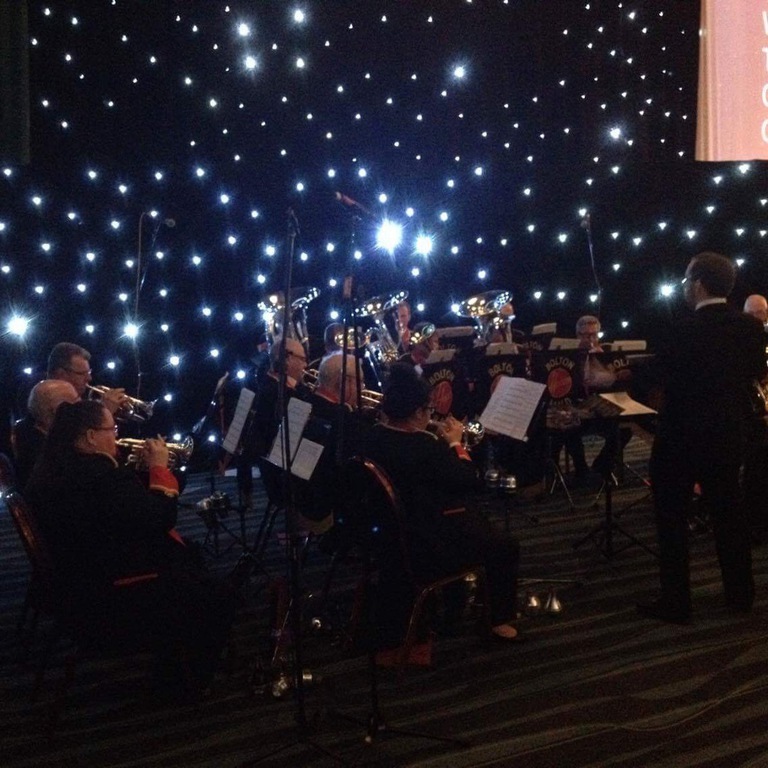 In between, came a wide variety of music including 'Star Wars', 'I'll Walk with God', 'Funiculi Funicula' and 'The James Bond Collection' as well as two outstanding solo items, performed by Principal Cornet, Sheena Whitehouse ('Solitaire'), and Solo Euphonium, Andy Jackon ('Song for Ina'). 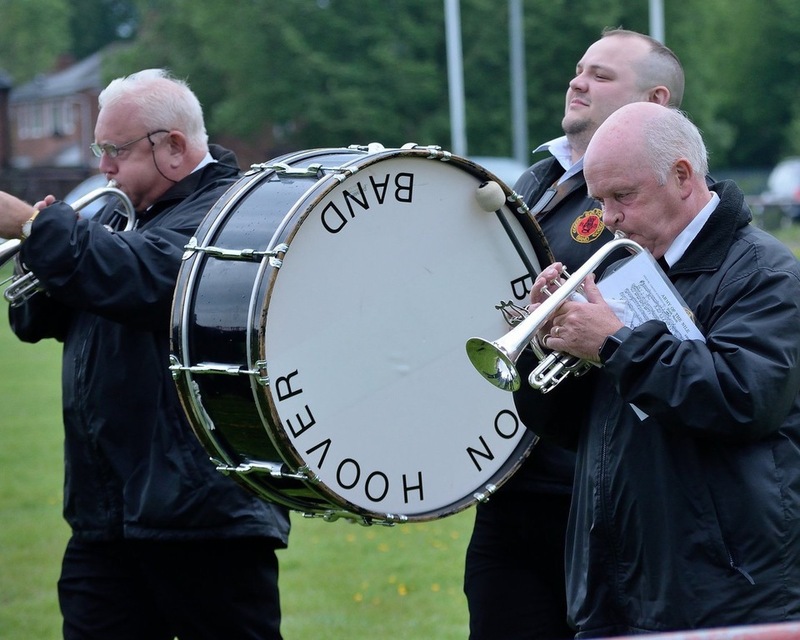 Trevor Halliwell has announced his resignation from his role of Musical Director with the Bolton Hoover Band. Trevor has been associated with the band for the last five years, which has proven to be a successfull partnership for both parties. we would like to thank Trevor for 5 fantastic years and wish him all the best for the future. 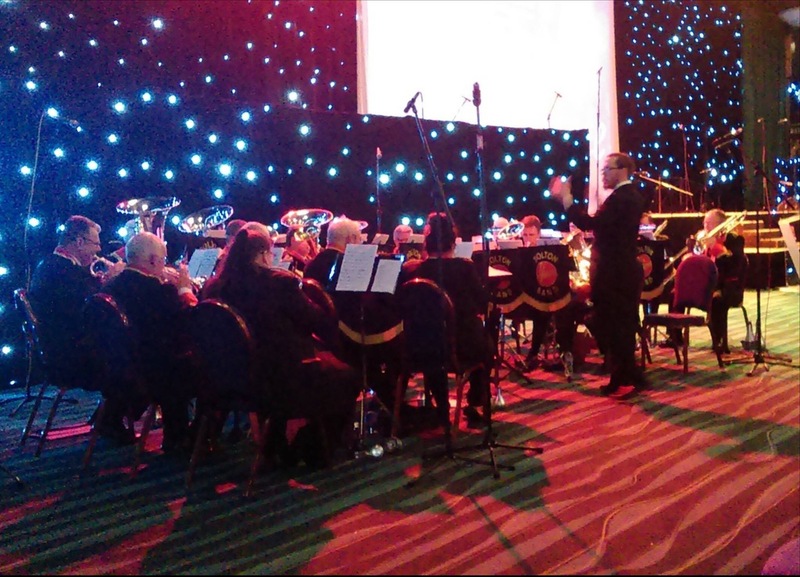 Hoover Band (Bolton) made there debut in the First Section on the 2nd of February 2014 at Preston Guild Hall, performing our work in progress test piece ''Cry Of The Mountain'' by Howard Lorriman. After competing with some of the big names such as Longridge, Hoover band (Bolton) came out in 8th position, a result that we are pleased with considering this is our first performance in the first section & the test piece which we can all say is still a work in progress. Well done everyone! (It was a little loud for PP to start, but it was secure, the 5th bar was not quite together, Cornet entry works well, 3rd bar of ''A'' Trombones were not quite together. At Bar 18 the horns aren't quite in tune on chord, at bar 30 couldn't hear thr Eb bass, Bar 42 is a little scruffy, I would prefer more build up, into ''E'' effective SfP's at bar 76.
at ''G'' some insecurity here upto ''H'', Cymbal Scrape ?, "I" does not quite bond together. Good build up into "J", Insecure 139-141, "K" effective, Two before "N" & into "N" Playing becomes untidy. Hoover Band (Bolton) went back to rehearsals on the 7th January were they started work on the regional set piece "Cry of the Mountain" During the break we have said goodbye to two of our experienced players. One being Martyn Kay who has gone back to his old band Eagley. The band wish him all the best with his playing career. Also we have said goodbye to Ann Wadeson who has decided to step down from playing to concentrate of her studies and work commitments. The band also would like to say a big thank you to both of these players for their hardwork and commitment over the years. The Band now are starting their hard work and preperation for Brass at the Guild on the 2nd February. We are currently looking for an all round percussionist to take over from John Wadeson who has stepped down to attend University. To apply for this position please contact us via our website. 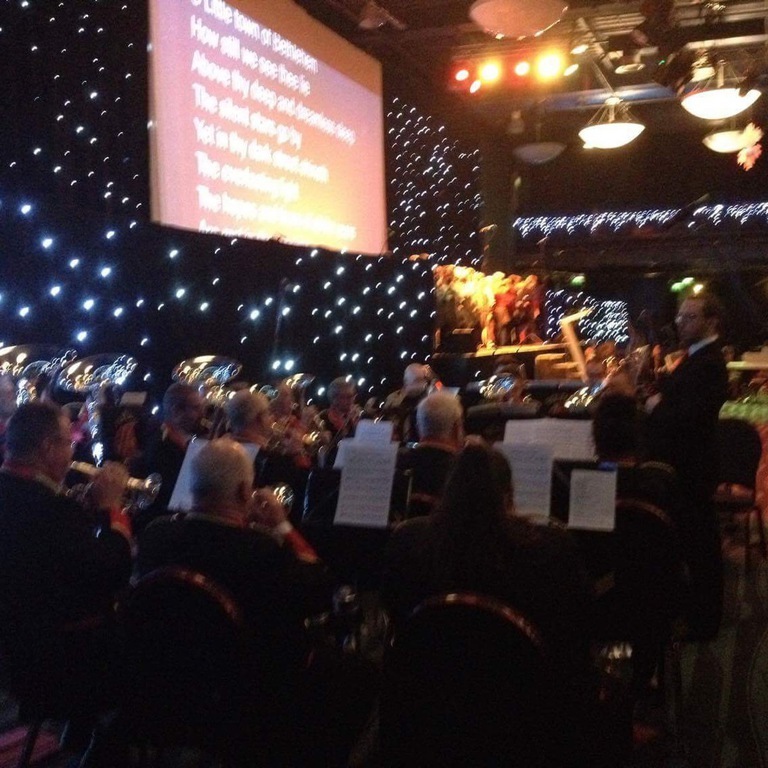 Hoover Band (Bolton) Ended their busy December on a high with their annul concert at Dunscar Conservative Club on Sunday 22nd December. This was an excellent concert with an excellent audience as usual. The band are now on a break until Tuesday 7th January when they return and start preperations on "Cry of the Mountain" for Brass at the Guild & The North West Regional Championships.